1credit: Add Himitsu-Bako to HQ. Himitsu-Bako is a simple ice barrier that appears as a digital puzzle box. What makes it special is the ease with which it can be uninstalled and installed in a different server, throwing up barriers in unexpected places and giving any intruder a curious feeling of déjà vu. Means: "puzzle box". Himitsu-Bako is missing the text that says "save Jinteki faction three influence by removing Ice Wall from your deck list". • exceptionally cheap barrier that gets blown away once their Corroder is down. • the ability is superb when faced with Runner decks that like to host Caïssa on your ice; wait for them to break it with Knight (2 ) and bounce it to trash the hosted Program. • hard ETR, something Jinteki lacks a lot of. • gives back 3 influence to Jinteki from not needing to include Ice Wall (because Wall of Static / Bastion cost too much). • you're never going to catch Parasite with the anti-hosted Program ability. • every other faction has better options in-faction for a cheap, early game stopper, so the light splash cost is irrelevant. • Midori could be used to switch out other ice that has been hosted for this, then you can bounce this to make space for the reinstall of the original ice. This may preserve the viability of some of the more positional Jinteki ice. • Combined with Jackson Howard (or Thomas Haas), Himitsu-bako is able to cause an entire server to disappear, negating any effects that require a successful (or unsuccessful) run. 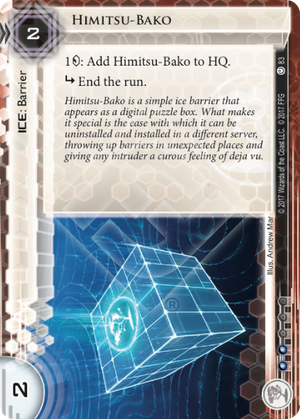 Himitsu-Bako has always been a useful ice for decks, an influence-free 2 End the Run. Parasite resistant (although not Parasite proof) barrier that can be redeployed (combos with Akitaro Watanabe, Tenma Line and Amazon Industrial Zone). Bako now has a new utility with the release of Democracy and Dogma - it combos very nicely with Bio-Ethics Association, Clone Suffrage Movement, Commercial Bankers Group and Sensie Actors Union. This is especially efficient if you've got an empty remote with a rezzed Bako already, just install your Political Asset in the server and if the runner doesn't trash it you can pull Bako back at the start of your next turn to trigger the ability. Now this seems like a nice one-off combo, since you will have an unrezzed Bako next turn that cannot be returned to hand, but this is where Surat City Grid comes in to rez your Bako for free. It's also possible to use the Amazon-Tenma jank combo as well but this seems highly inefficient ( and need to protect both Amazon and Tenma Line). Keep in mind that without some kind of rez discount the net cost of installing and rezzing Bako is 3. Himitsu Bako was relevant for Jinteki for quite a while, since it was the cheapest influence free gearcheck barrier for them for a long time; and though it's ability and stats beyond being 1 to break with corroder were rarely relevant, it was the simplest way to force the runner to get their fracter. However, this is no-longer relevant, besides some kind of jank use, as Vanilla is an impressive 0 to rez, which is basically impossible to beat. And sure, Vanilla dies immediately to Parasite, but if they are spending a parasite on a Vanilla, you are the one who is coming out ahead. Himitsu Bako; I miss when we had reason to run cards like you beyond in draft; maybe one day another interesting Jinteki barrier that can be repositioned with ease will come along; and maybe they will be given their chance in the lime-light too.